Bob Dickerman brings his wealth of experience to the MBCA Clinic this year. 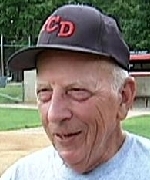 Coach Dickerman has spent over 70 years as part of the Providence Country Day baseball program, serving as the head varsity coach from 1957-2001. He currently is an assistant coach who continually throws batting practice and integrates his own style into various drill work. Coach Dickerman left Providence Country Day to become the head coach at Gordon College for three years, but then returned home to Providence Country Day. The MBCA is pleased to have Coach Dickerman share various nuances and tidbits about everyday drills that coaches need as part of running a successful program.